Previous studies on spider fighting with 'Kogane' spiders, or Argiope amoena, paid little attention to the ways of using the slender sticks on these games. I will discuss this issue, based on my field study during 2002-2010, in terms of ethnoentomology. 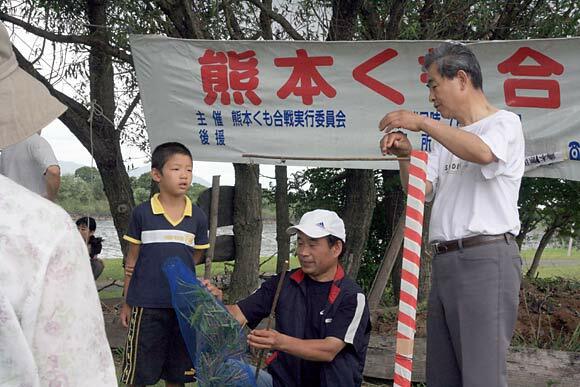 There is a slight variation among the usage of slender sticks in these games which volunteers put on. 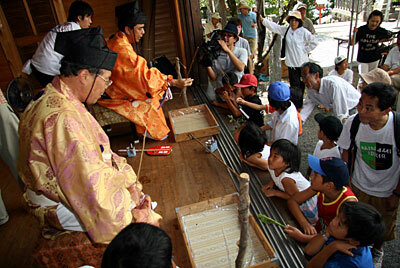 At Kajiki in Kagoshima Prefecture, the spider fighting contest was established in 1925. In those days, they might have enjoyed the games using slender sticks planted in the ground. In the Kajiki's present style, the slender stick on which spiders are put is fixed onto a vertical post, in a horizontal position (Fig. 1). This style had already come into being by about 1946. 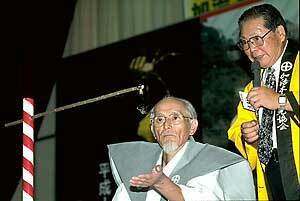 At Nakamura in Kochi Prefecture, the slender stick used to be held by the referee's hand. Then, the usage of the stick had varied until it was fixed onto the vertical post (Fig. 2). The spider fighting contest in Kainan City in Wakayama Prefecture and Kumamoto City are both modeled after that used in Kajiki (Figs. 3-4). On the other hand, at Kashinourago in Nagasaki Prefecture, the slender stick is held by the referee's hand on a nearly horizontal plane (Fig. 5). Let me point out another possibility that the Kashinourago's style still remains today because it is not connected with Kajiki. The referee's hands are free in the Kajiki's style, so the referee can judge the matches without any errors, do it lightning-fast, and protect spiders against injury or even death. Another point is that this style produces many detailed rules of the games. The facts above suggest that each of the spider fighting games has been refined even after volunteers first established the tradition. Fig. 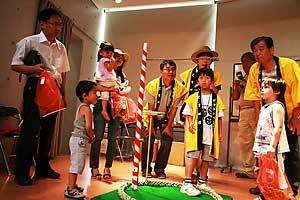 1 Spider fighting contest at Kajiki, on June 16, 2002. Fig. 2 Spider fighting contest at Nakamura, on August 7, 2005. Fig. 3 Spider fighting contest at Kumamoto City, on July 19, 2009. Fig. 4 Spider fighting contest at Kainan City, on July 13, 2008. Fig. 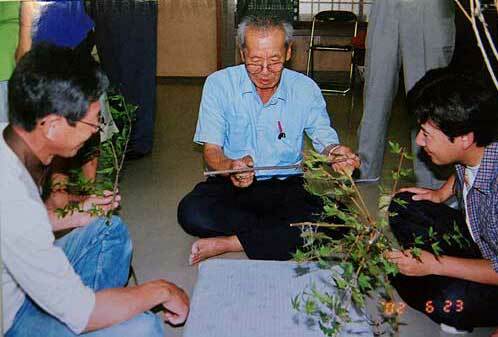 5 Spider fighting contest at Kashinourago, on June 23, 2002.